This month begins a new eclipse season - a lunar eclipse on June 26 in Capricorn (full moon) and a solar eclipse in Cancer (new moon) on July 11. Eclipses aren't like any other phenomenon in astrology. They strike quickly and in unusual ways. Often the catalyst to change is triggered by an outside event that has nothing to do with you or anything you did, but that will come in and change certain elements in your life anyway. Eclipses look for broken or outdated situations to sweep away to help you make room for the new. Some eclipses are shocking or jarring and others are harbingers of good news. The June 26 eclipse will have an especially strong impact because Uranus will be in sharp angle to the full moon eclipse and Sun. Also, Saturn will oppose Uranus and Jupiter, while Pluto will conjoin the full moon and argue with the other planets. All will square off at 90 degrees to each other, or stare at one another at 180 degrees, forming a cross pattern in the sky - this is considered stressful. We have not seen such an extreme eclipse in years. Astrologers have gone back 500 years and we have not been able to find anything like the one on June 26. Events that come up as a result of an eclipse have more weight than events brought on by a normal new or full moon. In fact, an eclipse is like a turbo-new or full moon - it packs much more energy and punch and feels like three rolled into one. An eclipse may even bring on an event that seems "fated." Eclipses always bring unexpected changes of direction. The eclipse does not have to fall in your sign to affect you, but it would have to be within a ten-degree range of a natal planet in your chart. In this case you would need a natal planet within ten degrees of 5 degrees of a cardinal sign: Aries, Libra, Cancer, or Capricorn. Eclipses in the same family of signs tend to be connected like pearls on a necklace. It is as though the universe realizes that we can't handle too much big news all at once, so it is divided up into pieces. We are given news of something that is changing or needs to be changed, but further information does not come until the next eclipse, at which time we are ready to move forward. For this reason, think back to what occurred on December 31 and just after January 15 for clues, for those were the last times we had eclipses in this family of signs. 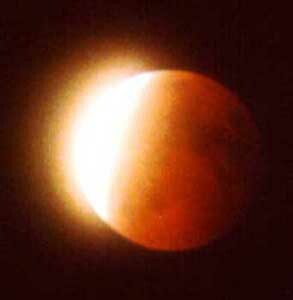 Eclipses shine the bright light of truth on the part of your life that is touched by the eclipse. Most of the time, eclipses act as brilliant illuminators, revealing a condition that you were unaware existed. They can also act as catalysts to a major life decision. Also under an eclipse, you may finally understand the true character of a person near you. With all eclipses, something ends and something else begins. During an eclipse period, you may feel like you are walking across a bridge to a new place of the mind and heart, but with no ability to turn back to where you started. Said another way, the door of part of your old life will slam shut and lock tightly behind you as you walk over the threshold. You won't be able to go back to your old life after the eclipse, but upon reflection, you might not want to anymore. You have grown, and now you are ready to face the future with all the surprises and gifts the universe will have ready for you. Armed with the necessary facts, you will now understand a mystery that was never clear to you before. The universe wants us to embrace all that is new, not go back to the old tried and true. In about six months, we will have another set of eclipses coming on December 21, a total lunar eclipse (full moon) in late degrees of Gemini and on January 4, 2011, a solar eclipse (new moon) in Capricorn. The December 21 eclipse will begin to usher in a new series of eclipses in Gemini-Sagittarius, just as the old series of Cancer-Capricorn, begun last summer on June 7, 2009, begins to wind down and officially end on July 1, 2011. Often when a new family of signs starts up, an old family of signs ends.